The longest continuous congregation in New Jersey is the Old Bergen Church in Jersey City. It began at the time of Dutch settlement in the area; its more than 340-year history grants it a special place in the history of Jersey City. In 1660, the settlers of the village of Bergen sought the founding of a place of worship. They began by holding services in a log schoolhouse and then decided to build a new structure for their congregation, the First Dutch Reformed Church. Shortly, in 1661, a burial ground and about four acres of land for a church were reserved for that purpose. They also started raising funds for the construction by collecting 417 guilders by taxation the following year. In 16 80, the octagonal, sandstone church with roof sloping to a point wasconstructed by William Day. It was located at the highest section of the Old Bergen Cemetery at Vroom Street, between Bergen and Tuers Avenues. A history of the church, describes the building as follows: "Its windows were quite high from the ground probably as much for protection from the Indians as to prevent the children from looking out during the services. The archways over the door and windows were ornamented with small bricks imported from Holland. The church was surmounted by a brass rooster used as a weathercock" ("Brief History of Old Bergen Church," 2-3). At the opening of the Old Octagonal Church on May 23, 1681, the Reverend Casper Van Zuiren from Long Island preached the first sermon. The congregation, consisting of members from the Bergen Township and Communipaw, eventually outgrew the Octagonal Church. Under its first regular pastor, Dominie William Jackson (1757-1793), the congregation built a second church on the southeast corner at Bergen Avenue and Vroom Street in 1773. It too was built of sandstone; the weather vane from the previous church was attached to its spire. It was eventually placed on the cupola of the Columbian Academy, now the site of the Martin Luther King, Jr. School on Academy Street and Bergen Academy. New Jersey colonists were divided in their sympathies during the Revolutionary War. Historian Richard McCormack claims that "The Conservative branch of the Dutch Reformed Church . . . was preponderantly Tory, especially in Bergen County (128)." However, the Reverend Jackson, a skilled orator, openly addressed his congregation about support for the patriots. His comments resulted in a personal reprimand before Lord Howe, the British Commander of New York. The Reverend John Cornelison (1793-1828) succeeded Jackson; during his long tenure, Cornelison held services for slaves in his home, some becoming members of the congregation. The third and presen t structure, now called the Old Bergen Church, was builtin 1841 on the site of the old parsonage and dedicated on July 14, 1842. Located on Bergen Avenue at Highland Avenue, it is one hundred yards from the earlier two buildings. The Greek Revival style one-story structure features a full-length portico with post supported by six columns in front of a brownstone façade. It was built by William H. Kirk and Company and Clark and Van Nest of Newark, New Jersey. In the center of the façade is the church tablet of white marble on black marble and inserted cornerstone. Also from the façade, two doors open to the vestibule. Stone from the 1773 church is embedded in the south wall of the church. Atop the church is a wooden belfry. Below the eave is a wooden facia around the roof line. The interior has a balcony and features mahogany decor. The stained glass windows reveal the benefactors and founding members of the congregation and community. They were contributed by the Van Reypen, Newkirk, Van Horne, Sip, and Van Winkle families, among others. An original signed Louis Tiffany stained glass window is in the sanctuary. Until the early nineteenth century, church records and sermons were preserved in Dutch. In 1900 a Sunday school was added at the northwest corner. A Memorial Chapel, constructed in 1959, honors the men and women of the congregation who served in the military during World War II. A meeting room, named for the Reverend Dr. Cornelius Brett (1876-1916) built in 1924, contains artifacts from the earlier churches. Among the items are two communion cups made from silver by Hendrikus Boele in 1730. They have been exhibited at the Metropolitan Museum of Art. In 1970, the Old Bergen Church and the Trinity United Presbyterian Church formed a union. The Trinity Church, which served the same area of Jersey City, was an outgrowth of the merger of the First Presbyterian Church founded in 1809) and the Westminster Presbyterian Church (founded in 1869). The new federated church retains the name "Old Bergen" Church. 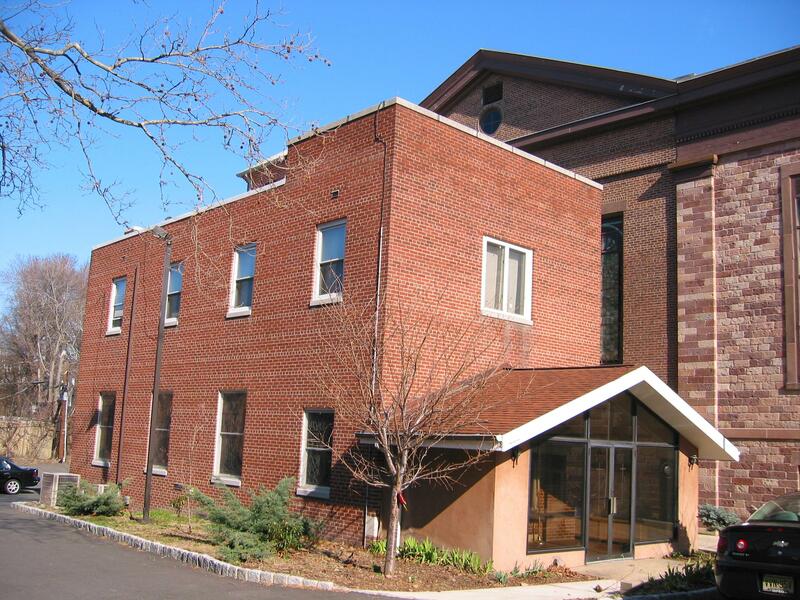 In the 1980s, the Old Bergen Church helped to develop the Newport Interfaith Center sponsored by six denominations to address the religious needs of Jersey City's new residents at the Newport section of Jersey City. The Chapel of Peace is also used by the new Filipino congregation of the Evangelical Methodist Church and the Asian Indian congregation of the Reformed (RCA) and Presbyterian (PCUSA)Churches. "Brief History of Old Bergen Church: From Its Beginnings to the Present Day." January 12, 1976. Joan D. Lovero Collection, New Jersey Room, Jersey City Free Public Library. "300th Anniversary of the Bergen Reformed Church - 'Old Bergen' 1660-1960." Jersey City, NJ: "Old Bergen Church of Jersey City, New Jersey." November 1960. Joan D. Lovero Collection, New Jersey Room, Jersey City Free Public Library. "330 Years and Still Caring." Jersey City, NJ: Old Bergen Church of Jersey City, November 1990. Joan D. Lovero Collection, New Jersey Room, Jersey City Free Public Library.